Figure 2 from Pietak et al. 2013. 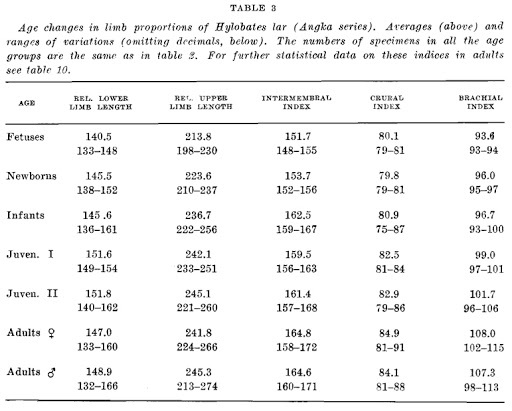 Human within-limb proportions are such that the length of each segment (e.g., H1-6) of a limb, from fingertip to shoulder (A) and to to hip (B), can be predicted by a logarithmic periodic function (C). The biological significance of this pattern is difficult to discern. The length of a limb segment is determined by a number of factors, including the spacing between the initial limb condensations embryonically, and thereafter the growth rates and duration of growth at proximal and distal epiphyses. As a result, limb proportions aren’t static throughout life, but change from embryo to adult. For instance, here are limb proportion data for the coolest animal ever – gibbons! – from the great anatomist Adolph Schultz. 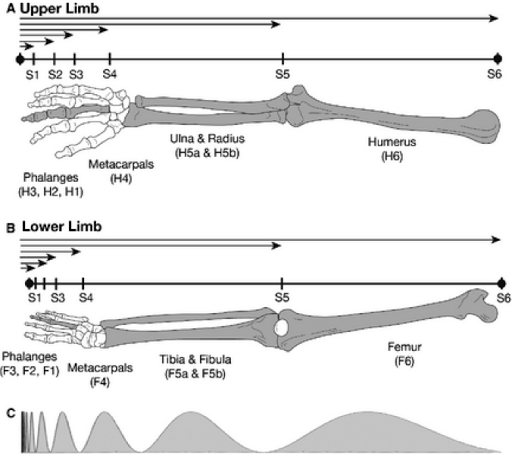 An important question, and follow-up to Pietak et al’s study, is whether human limb proportions can be described by such log-periodic functions throughout ontogeny, and if so how these change. Plus, it’s also not clear to what extent human proportions might happen to be describable by log periodic functions, simply because each segment is shorter than the one preceding it proximally. In short, this study raises really interesting and pursuable questions about how and why animal limbs grow to the size and proportions that they do.